Forms are important and unavoidable part of any website. Bootstrap 4 uses the standard HTML5 form elements to add variety of elements within a form. In this article let us explore on how to create different styles of forms in Bootstrap 4. Remember, Bootstrap is a frontend framework. It only allows you to create readymade components with precompiled CSS and scripts. You should find a way to process the form inputs received at your server. .form-control Text inputs It can be a text, password, date, time, etc. Forms can contain different types of elements like text input, password, single select, multiple select, textarea, file upload, checkbox, radio buttons and submit button. Each element is grouped inside a <div> with “.form-group” class. 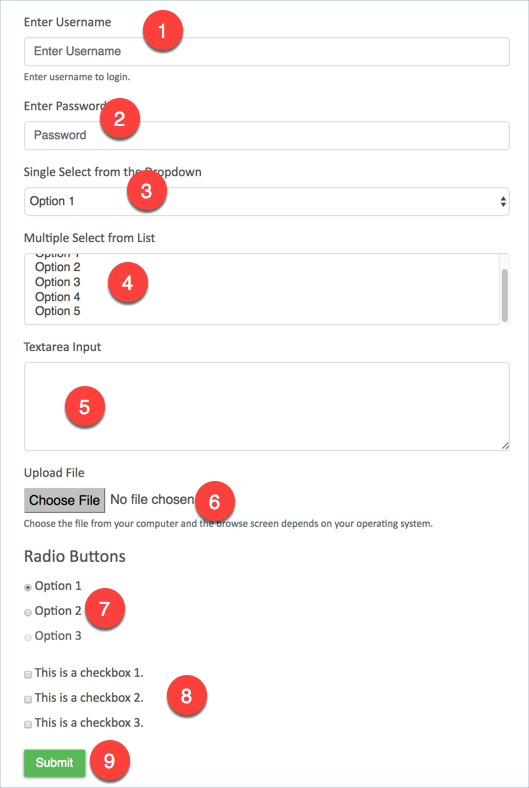 You can also use <fieldset> to group similar elements like radio buttons and checkboxes together. Let us create a kitchen sync form with different elements to understand better. This is a checkbox 1. This is a checkbox 2. This is a checkbox 3. The form elements are identified with numbers and the corresponding code is marked with the comment section for understanding purpose. The above kitchen sync form has the complete code including Bootstrap CSS and scripts. In all the below examples, we have only given the code block for form component. You can replace the code block between start and end of form with the following codes to create different styles of forms. And the result will be shown like below with all three elements aligned horizontally in a single row. The grouping will add the border bottom as shown below, you will not see any other visible changes with “.form-group” class. “.form-control-lg” to make the elements larger. Use “.form-control-sm” class to make it smaller. “.form-text” class is used to add help text in muted form with the help of “.text-muted” class. By default the form elements occupy full width which can be restricted by placing it inside a container or using additional CSS. 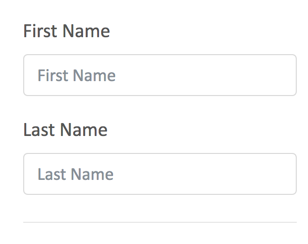 Also you can place the forms inside grid classes to control the size and responsiveness of the form. It is also possible to have disabled elements using “.disabled” class. The important part of using forms is to validate the mandatory inputs are entered by the user. There are two ways to validate the inputs – use custom script for validation or leave the validation part to the browser. Below is the code for creating a form with custom validation script. The script will check all the required form fields are entered by the user when the submit button is clicked. The validation will show the below result if the user click the submit button without filling the mandatory fields. You can just remove the custom script in the above form code to allow the browser to stop the form submission. The default validation is done by all modern browsers like Chrome, Safari and Firefox. You will see the following error message, when the user did not fill the required field and submit the form. Forms are important component on any webpage for collecting user inputs. 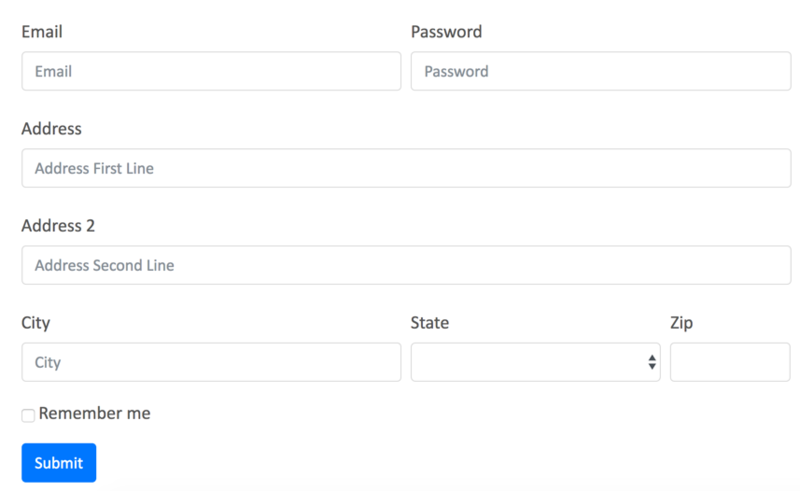 Bootstrap 4 allows to create simple to complex forms to show different input fields with grouping. But complex validation and processing of the collected data at server side needs a scripting language like PHP. So, you should integrate the forms in PHP to get and process the user data. How to Install WordPress Locally with XAMPP?